Food preparation can be just as important as cooking the food itself. 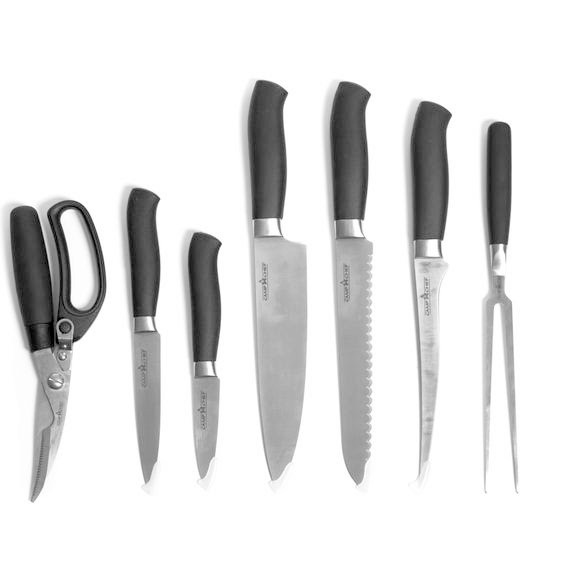 That is why Camp Chef offers a 9 Piece Professional Knife Set that will help you prepare your food to your liking. The hardened stainless steel blades are made to last while the ergonomically designed rubber handles will give you comfortable control when preparing your meal. Food preparation can be just as important as cooking the food itself. That is why Camp Chef offers a 9 Piece Professional Knife Set that will help you prepare your food to your liking. The hardened stainless steel blades are made to last while the ergonomically designed rubber handles will give you comfortable control when preparing your meal. Included is a cutting board that will provide you with a clean cutting surface and a convenient carry bag to keep you organized from the kitchen to the campsite.